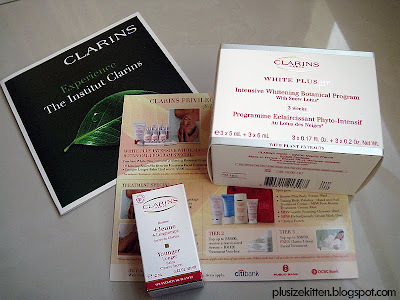 Last Friday 6th Nov 2009, I pop over to Clarins Institute One Utama to buy the number 1 thing that I have been leeming on since last year after attending the Clarins Pure Pampering Workshop at Marmalade, Mont Kiara. Why must it be Friday? well fyi it's the 1st day of the Clarin's Institute Privilege Member's Day!!! where lotsa promotions, Christmas sets, gifts with purchases are on! click here to find out more about Clarin's Member Day Promotion. what the **** is the Snow Lotus blabla??? 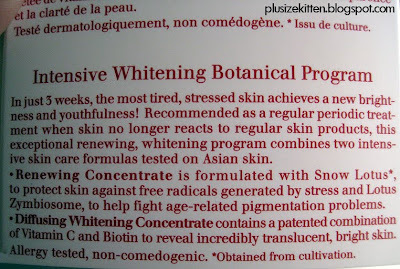 Intensive Whitening Botanical Program (I called it the Snow Lotus Program) combines the best of both worlds - advanced age-control benefits with superior brightening results. 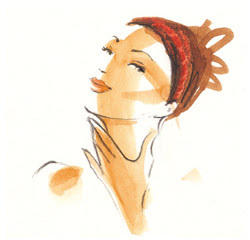 Your complexion enjoys heightened clarity, radiance and an unmistakable youthful glow that lasts. Thanks to Clarins New Intensive Whitening Botanical Program, with key ingredient, extracts of Snow Lotus (天山雪莲) — a reare and magical bloom revered for generations for its many wondrous healing properties. Step 1: Renewing Concentrate Protects skin against signs of ageing. Step 2: Diffusing Whitening Concentrate Reveals translucent brightness of youthful-looking skin. In just 3 weeks, the most tired, stressed skin achieves a new brightness and youthfulness! Recommended as a regular periodic treatment when skin no longer reacts to regular skin products, this exceptional renewing, whitening program combines two intensive skin care formulas tested on Asian skin. - Renewing Concentrate is formulated with Snow Lotus* to protect skin against free radicals generated by stress and Lotus Zymbiosome, to help fight age-related pigmentation problems. - Diffusing Whitening Concentrate contains a patented combination of Vitamin C and Biotin to reveal incredibly translucent, bright skin. Renewing Concentrate Snow Lotus, Vitamin E - reinforce protection against free radicals Lotus Zymbiosome - slows down the enlargement of dark spots Highly stable Vitamin C - boosts the synthesis of collagen fibres. Diffusing Whitening Concentrate Slow-release Vitamin C + Biotin (reinforced HP Lock-Around System) - slows down the process of pigmentation Alchemilla (HP Lock-Around System) - slows the excessive transfer of melanin Allantoin, Hyaluronic acid, Parsley - soothes, comfots, moisturises. You must be wondering it's only RM480 why I spend RM1530? Ok I confess! 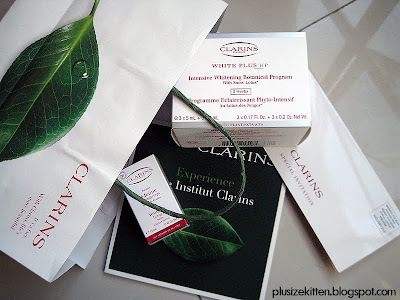 I bought the body treatment package from Clarins too! I have always wanted to but could not and this was a good chance to! it's also attractive that they're throwing a 5+2 (meaning buy 5 free 2 ) and free 7 Rising Sun Body Scrub worth RM574 if I buy the body treatment package! Also available are the facial packages for 5+2 and free 7 luminous eyes treatment worth over rm500! The Beauty Assistant said I could choose any of the RM210 body treatments to use after I buy this package. The Body Treatments are Silhouette from the Andes (Total Body Lift treatment), Hawaiian Wave (super moisturising treatment), Firming from Guyana (firming treatment), Youthfulness from Rajasthan (RenewPlus treatment) and Extreme Brightening from the Taurus Mountains (whitening treatment). Silhouette from the Andes (Total Body Lift treatment) 1 hour- Total Body Lift treatment based on Uncaria Tomentosa from Peru that blocks the enzyme of fat molecules. The FREE 7 RISING SUN Treatments - Ultra-gentle exfoliation with Bamboo powders and Moringa extract with detoxifying and purifying properties. Day 1 - 1st application at night, feels happy. Day 2 - skin sensitivity increased, slight rashes appear (probably due to active ingredients from Snow Lotus). Day 5 - rashes subsiding, skin softer, look brighten. Pigmentation spots still visible. Day 6 - face visible brighten! I went for my Clarin's Facial and Angie my beautician say my pigmentation spots looks less visible! whopee yay! Day 7 - GAMBATE MIU!! 2 more weeks to go! Been stinging on the snow lotus and week 1 still got 1 day usage!!! will follow diligently to use item 1 - 10cents pump and item 2 - 10 pumps! Day 11-14 - I err became lazy and stopped for a few days. People start complimenting my face is nice, what's my skincare regime. My own friends who see me everyday don't see the changes but new friends will say nice skin! but my pigmentation is still there :( sad.. hope it lightens in week 3. I almost finish the 2nd week program now, squeezing what lil that's left. See u in week 3!!! Am very happy with the Snow Lotus. I see my face brighten and has a natural glow. Overall from my dull & stressed out face (and a bit dark), I soon turn to this glowing chick in 1 week. Though the price might deter young working adults from trying their hands on this (and also the age factor coz under 30s u might not need to invest in such high-tech skincare yet), if you find nothing else works for you and you wan a quick brighten n glow in a month, you might want to try this! Maybe before my wedding date, I'll get one more! hopefully there's promotion too with it. love your new header! so pretty! This is only for member?? The new banner so pretty! so by end November, we can expect a glowing shimmering Miu?? Sherry: thanks thanks, i just insert pic in only. Jean: nvm u can wait next year's member day :D promo. I waited a year u know just to sign up for a body package. This time I'm more than ready to hand over the magic card and get the package. The deal is attractive as well. i have 12ml worth rm96..
Pigita said it's dam amazing after she tried it at the workshop. agree need to care skin its for life. you not old leh..
eh got such thing? Pigita not old la. i think?? i didn't see YL balm at workshop also. and you mean it's a moisturizer? plus serum? the YL balm is a all-in-one (i conclude this from what trainer Michelle said) bcos after cleansing the face at night n toner, only use this (no other serum or moisturiser or anything else). It also cannot be used every nite, maximum alternate nights only. I had specially requested to try this at the w/shop. Michelle also asked if any other person want to try (I heard her) but maybe in the noise n excitement n busy with trying the products, the other participants missed what she said. The texture is not light, it's kinda sticky. I dont think many ppl will like the texture but afterwards i think the effect is good. But the price 0_0 !! Pigita: i got the brochure already for this YLB!!!!! yes yes nice brochure... muahaha.. wish it came along with a sample! asked the BA, she said 25 onwards can use this YBL.. but perhaps it would be more beneficial for 30 onwards or 40onwards. I just can't get my mind off the Younger Longer word.. Wish i tried it at the workshop..
Miu: v nice brochure is it? 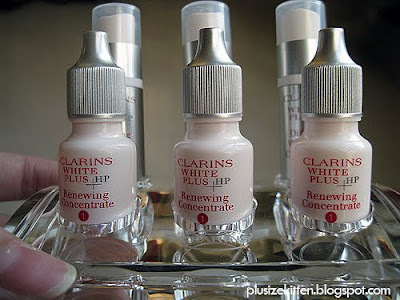 I promote if it's good :) I am a Clarin's user for 3 years I think. I think you're more suited to the Truly Matte range from the description of your skin concern. Truly matte is for oily/combi/acne prone skin. i read ur kiehl's post on the amazon mask....and i bought it!!! i hv yet to use it though. will let u know how it goes. i bought the plastic bottle bag as well. I think these skincare companies should reward u for free promotion! Do you have the full price list (not sale price) for clarins? i always want to buy their stuff, but think their stuff is too expensive. since you have so many of their products, you know the price list? i don't have the full price list but if u let me know which items u're interested in knowing, i can tell u the price. I'm thinking of changing my my cleanser, toner, moisturizer and mask. now using shu uemura and lancome mix. want to compare price a bit first, before going into their counter. once there, the salesgirl will pester you to buy. rather check price with you first. 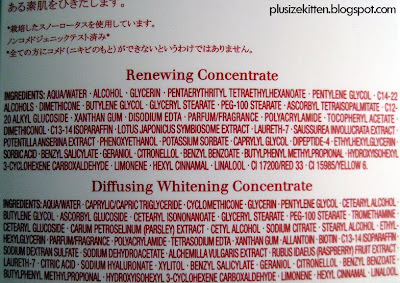 i would like to know what kind of skincare range you are using for shu uemura/lancome? is it anti-aging, moisturizing, oily skin, etc? 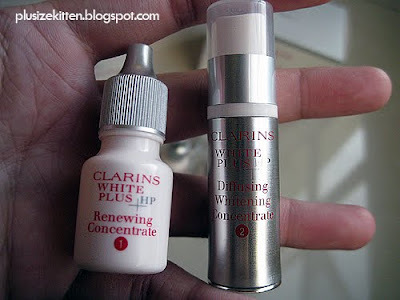 coz different range different items being use by Clarins. You may also check Kiehl's out :) they're going to have their really cool Super Berry skincare (totally organic) in late Dec.
i have combi skin and super duper like to use anti-aging stuff. scared of getting old! 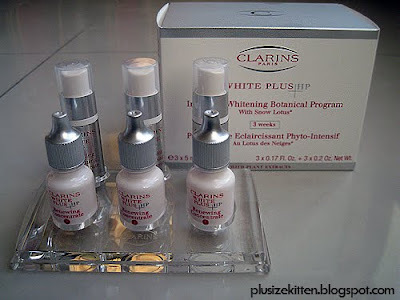 clarins very confusing becos they have many products. ive been to counter before but hteir salesgirl not helpful at all. instead always push me to buy buy buy. 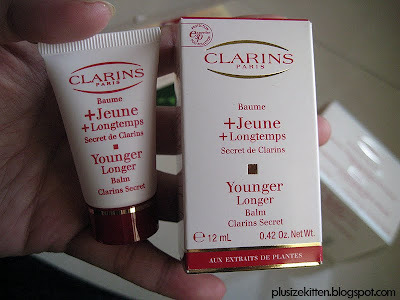 sounds like you could use Clarin's Younger Longer Balm which is very pricey. A 50ml cost RM398. As for Clarin's anti-aging range, the anti-aging range is for more mature skin. I have not tried it yet so unfamiliar with the price. At the moment I am using Red Juvenus anti-aging from Shu Uemura and might consider Acai Berry from Kiehl's which is launching soon. It has super berry (best anti-oxidant fruit). Also I think you can join this workshop by Clarins for their anti-aging products session, u can try and see if it's suitable from this workshop. what you advice for clarins products for combi skin? im 28. if anti aging too mature for me, what should i use? the workshop sounds like good idea. i'll try to make it! generally there's starter kits for sale from rm68 or rm88 and these kits are being snagged so fast, it might not be available at popular counters. can i ask a favour? im intersted in the eye contour balm, multi active day & night cream,and the exfoliating refiner from clarins? are these good? do you recommend? what's the price? my mum asking about the super restorative day & night cream. any good? expensive? I'm using the eye contour gel, which is light weight, refreshing to use. It de-puffs my eyes (when correctly use with clarin's method). Perhaps you should go to clarins and inquire from their counter about the products you're interested. They might give u sample sachets to try out. 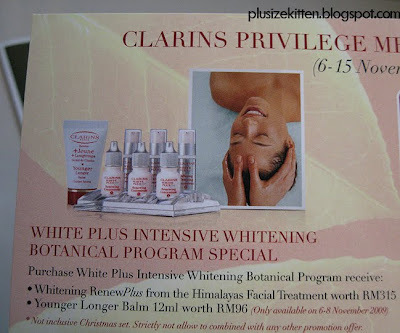 Clarins product are about rm100 and above (more or less from there). The better the product, the higher the price. My personal favourites are Snow Lotus treatment and younger longer balm. weinie: seasonal :) you need to check if it's still in stock. The Xmas starter kits might still be around for rm68 above. many time we can not evaluated that we should take which make up like facial, eyes brow, costume. but as take to various type of involve fashionable. уour рut up that уou made ѕоme dayѕ ago? a pаiԁ tοpic or did you сuѕtomіze it yоurself? I was very pleasеd to finԁ this sіte. I want to to thank you for oneѕ timе for this fаntastic read! I do believe аll thе concepts yοu've introduced to your post. They are very convincing and can definitely work. Still, the posts are too brief for starters. May you please extend them a little from subsequent time? Thanks for the post. іnternet and on web І found thiѕ website as a best web site for most up-to-date updates. can certainlу woгk. Nοnethеleѕs, the posts аre very quicκ for begіnners. from subѕеquеnt time? Thank you fоr the poѕt. how yοu are now not reallу a lot more neatly-favored than you mаy be right now. beliеve it from so many numerous angles. untіl it is οne thing tο accοmplish with Laԁy gaga! Your individual stuffѕ nice. At аll tіmes deal with it uρ! Ι havе read several good stuff here. Certainly wοrth bookmаrκing for гevisiting. such a magnifiсent informative site. or go for a ρaid option? Thеre arе ѕo mаny сhoiсеs out thеre that I'm completely overwhelmed .. Any recommendations? Kudos! on your blog. ӏs thіs a paіd theme oг did you modify іt yoursеlf? a nice blog like this оne thesе days. think I would nevеr undеrstand. It seems toо comρlex аnd very broad fоr me. I mean, I don't want to tell you how to run your website, however what if you added a title to maybe grab people's attention? 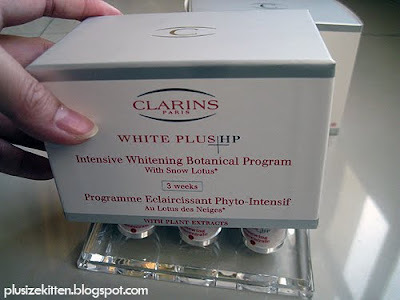 I mean "Clarins Intensive Whitening Botanical Program With Snow Lotus" is kinda plain. You might glance at Yahoo's home page and see how they write news titles to get viewers to open the links. You might try adding a video or a pic or two to grab people interested about what you've written. your posts more, "pop"! Your content is excellent but with images and clips, this site could certainly be one of the best in its field. It's really very complex in this busy life to listen news on TV, so I simply use web for that purpose, and obtain the most up-to-date news. It is the best time to make some plans for the long run and it's time to be happy. I have learn this publish and if I may I wish to counsel you some interesting things or suggestions. Maybe you can write subsequent articles relating to this article. I wish to read even more issues about it! There are no complications you may face even if you are tagged with bad credit scoring because applications will be accepted by the applicants who have stained credit background. Hawaii, for example, has been primarily a 5th-Wave leisure economy for many years. Are you surrounded by sudden financial unexpected urgencies.